After a breakfast of French toast made from left over baguette, we drove into Wiltshire. It was a day of neolithic archeological sites, as well as castles and cathedrals. We went to Stonehenge, Woodhenge and Avebury Circle of Standing Stones. Circles of standing stones are scattered across England, but in Wiltshire, there just happens to be a concentration of them within a few miles. 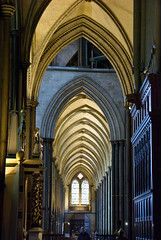 We went into Salisbury, toured its Cathedral. With the tallest cathedral spire in England it’s an impressive sight. Inside it is filled with the tombs of illegitimate children of king’s of England. Just outside Salisbury we stopped at Sarum Castle. On our drive home, without really looking for it we found one of the many mysterious White Horses of Wiltshire. Dinner was a night out at another favorite restaurant of ours, the Bel and Dragon in Cookham and topped the night and their visit with some sticky toffee pudding. Posted by deb on Tuesday, March 11th, 2008, at 11:05 pm, and filed under England Sites, Historic Sites & Monuments, Travel, Travel: England. « Batton Down the Hatches!